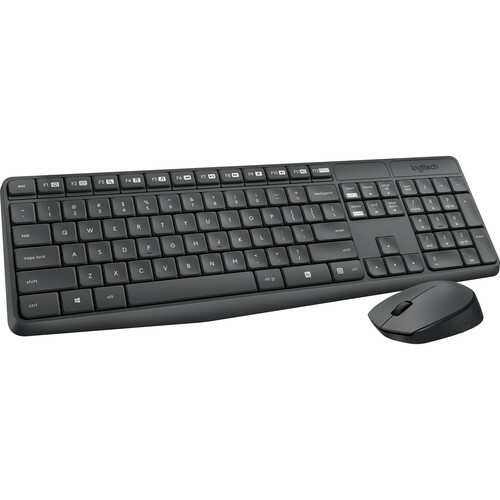 The MK235 Wireless Keyboard and Mouse from Logitech provides wireless typing and mouse cursor controls for Windows, Linux, and Chrome systems. The keyboard features low-profile keys and is height adjustable to provide a comfortable typing experience. For accurate cursor movements across different solid surfaces, the mouse is equipped with an optical sensor. The keyboard and mouse connect to a computer via an included USB receiver that offers a wireless range of up to 33'. The keyboard is powered by two supplied AAA batteries, which last up to 3 years, and the mouse runs on a single AA battery for up to a year. To save battery life, the mouse has an on/off power switch. Box Dimensions (LxWxH) 14.0 x 5.5 x 1.5"
MK235 Wireless Keyboard and Mouse is rated 4.7 out of 5 by 3. Rated 5 out of 5 by TO from A Good buy. This was a good buy. No setups, just plug in and go. Both keyboard and mouse work seamlessly. I especially appreciate the comfort and intuitiveness of all the keys.